If embroidery of name is desired, please enter English or Hebrew name in text box. This graceful tallit is a beautiful way to express your Judaism as well as your personal style. 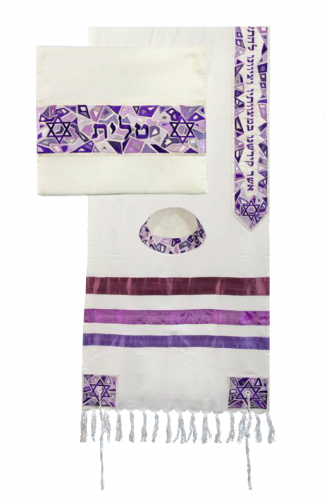 The tallit is cream raw silk embroidered with a Magen David (Jewish Star) pattern on a geometric crystal background in shades of purple .The design adorns the tallit's corners and neckband, which features the Hebrew inscription "Asher Kidshanu BeMitzvotav VeTzibanu Lehitatef BeTzitzit". This set comes with a matching bag and kippa. Tallit measures 20" x 75". If embroidery of Hebrew or English name is desired on bag it can be added for $10. Please write name in the text box at checkout.